A few years ago, director Jeremy Berg gathered a cast together at the remote childhood home of his producing partner Matt Medisch to film a story he and Medisch had crafted with John Portanova. Berg's feature directorial debut, the film had the working title of Sader Ridge (the name of its location), but ended up being released as The Invoking. I assume the title change came about because the movie was making the festival rounds in 2013 and reached DVD in early 2014, and in the midst of this, in the summer of '13, James Wan's The Conjuring came out and was a big hit. The Invoking sounds pretty close to The Conjuring, doesn't it? The film itself was not like The Conjuring at all. It centered on a young woman who was adopted at the age of 5 and retained no memory of her birth parents. When her biological aunt passes away, Sam inherits her isolated home and takes a trio of friends with her to check it out. Once they're there, things begin to get very strange. Is the place haunted? Is Sam losing her mind, or regaining her memory? And what is up with the awkward guy who works as the property caretaker? Although not the most exciting movie, taking the "slow burn" path, The Invoking was a solid one, and impressive when you take into account that it was shot on a miniscule budget over the course of just one week. There is now a sequel to The Invoking, but it actually has absolutely nothing to do with its predecessor. 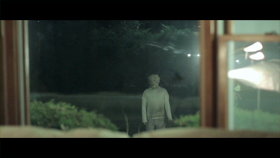 Unlike the first movie, The Invoking 2: Paranormal Events takes the anthology approach, consisting of six short tales by six different directors. I'm not sure if any of these shorts were made with the intention of being part of The Invoking 2, either. At least a few of them were made before The Invoking was ever released, with one having been filmed back in 2009. Well, putting a title with some recognition on a compilation of shorts is one way to draw in viewers. Filmmakers can't take the blame for marketing, so to be fair The Invoking 2 just have to be evaluated on its own merits. The segments are: Jamie DeWolf's U-Turn, Adam O'Brien's Insane, Jay Holben's Alone, Patrick Rea's Do Not Disturb, Corey Norman's Natal, and Jamie Root's Melissa. U-Turn runs just over 4 minutes long. It's a dark and twisty tale of death on the road, but didn't make much of an impression on me. Insane deals with a filmmaker on a location scout at an abandoned asylum where terrible things happened. I didn't find this one very interesting, as it was largely just two people wandering around in the dark. That gets tiring after 10 minutes or so. In Alone, a woman is haunted by... herself? It's a decent short, although I'm left confused. I don't think it was really a paranormal event, but in that case the ending makes no sense. Do Not Disturb is the one that was filmed six years ago, but there is no noticeable shift in picture quality between this short and the rest of them. The quality, style, and tone is surprisingly consistent throughout. Whoever picked all of these to pair together did a good job. DND tells the story of a serial killer on the run who, deservedly, has a very unpleasant stay at the Sleep Well Hotel, and was my second favorite segment out of all of them. My favorite was Natal, which also happens to be the longest, running approximately 25 minutes. It's sort of reminiscent of the first Invoking - a young woman and a trio of friends go to a remote location, in this case a lakeside cabin, where strange things start to occur and relationships start to crumble. Like Alone, it's one that leaves me confused, but I enjoyed the ride. The movie ends with the segment that saves U-Turn from being the shortest one. Melissa only lasts a minute and a half, and the events in it aren't necessarily paranormal, but it's a nice note to end on. Overall, The Invoking 2 is a very watchable little anthology, providing 83 minutes of dark atmosphere and ghostly and/or psychological chills. It's not likely to blow anyone away, but it's a fine way to pass the time on a dark night.